We have decorating ideas for rocket ship baby nursery themes, outer space bedding and DIY projects for the baby's nursery on this page. 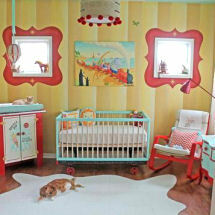 The examples featured in the photographs are here to help you choose from collections of pretty crib quilts, space theme bedroom accessories and to learn how you can save money by making some of the decorations yourself using crafts tutorials that others have provided or used with success. 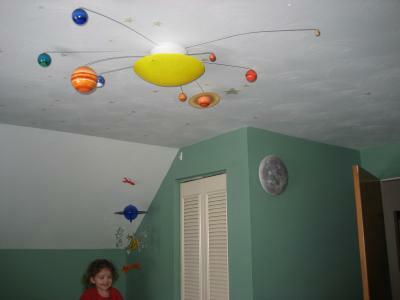 There are decorating ideas for your little boy or girl's rocket ship bedroom that are sure to delight and inspire your future astronaut. Space bedding for a baby boy doesn’t have to be covered in rocket ships blasting away towards outer space. The fabric pattern can be something as simple as a classic moon and stars bedding set or as fancy and complex as a planet print. At this stage of decorating the bedroom getting the atmosphere and color scheme right is key. So long as your planetary bedding set has motifs that point toward the moon, stars or at least one of the planets you will be fine. The planetary theme is not every budding astronaut's taste. Silver rocket ships in mid-takeoff leaving a big cloud of smoke in their wake is much more exciting than the dark, quiet sky sprinkled with a few uninhabited planets and distant stars. Here we have lots of possibilities and ideas for decorating a nursery room for a baby boy or girl in a theme that takes them on virtual adventures far beyond the Milky Way. For the kids more in tune with creatures from outer space, perhaps an alien theme bedroom would be the ticket. A comforter covered with creatures from Mars and alien pictures and posters on the bedroom wall will make the most imaginative child happy. 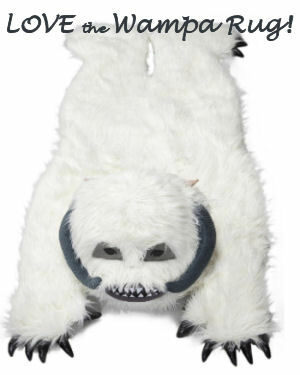 If daddy is a Star Trek or Star Wars fan, there are licensed kids' Star Wars bedding sets with characters from the movies with their favorite film's title or logo as well as rocket ships and the Milky Way featured in the background. 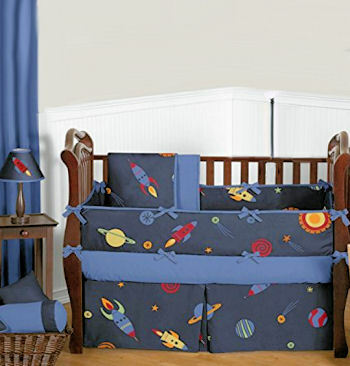 No matter which of the rocket baby nursery themes that you want to explore, there is a set of outer space baby bedding that will get you ready for takeoff in a stylish and fashionable way. 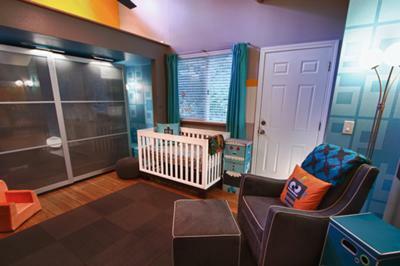 I would also like to invite our friends to take a look at Unique Baby Gear Ideas' gallery of baby boy nursery pictures to see examples of how other parents have decorated rooms in this theme. Do you have a great set of baby bedding or a picture of a nursery that you decorated in a outer space or rocket ship theme? Share it!